Proposed new permit areas in yellow. Existing permit blocks in green and unassigned block in brown. It has been an exciting week for the oil and gas industry. 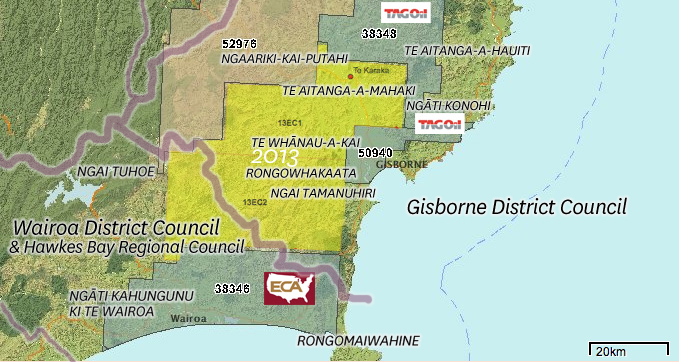 Todd Energy published a 180 page ‘no worries’ fracking tract and the Government announced plans to open up a large area across the flats and into the hills between Te Karaka, Tiniroto and Frasertown for petroleum exploration. Todd acknowledges in its submission to the Parliamentary Commissioner for the Environment’s inquiry that “many of the environmental risks raised as concerns relating to hydraulic fracturing apply to all exploration and production drilling.” That’s been my concern for some time and I agree to a point with industry suggestions that most of these risks can be managed with ‘best practice’ and strong regulation. The claim that opposition to fracking in New Zealand is being based not on evidence, but on misinformation and emotion really is ironic. Are the professors at Duke University, Cornell University, Penn State or the University of Alberta misinforming us with their peer-reviewed, published empirically evidenced papers? Which regulators that have concluded fracking was the cause of water contamination, earthquakes and/or air pollution were being too emotional in their reports? We hear claims that there has ‘never been a major incident in Taranaki’, yet a recent oil spill that reached the Kapiti Coast took 265 days to ‘clean up’ and in one year alone three workers were killed on Taranaki wells. Taranaki Regional Council reports reveal chemical contamination of ground water near the Kapuni well so bad that it should not even be used for irrigation, let alone stock or human consumption. No one is suggesting that every injected well results in drinking water pollution or dangerous earthquakes, but the evidence from independent scientists all over the world confirming contamination makes it clear that fracking is causing serious issues. The Todd submission acknowledges that there are real problems to deal with. Common concerns relate to water pollution through fugitive emissions from well casings, air pollution from flaring and spray disposal, soil pollution from spills, leaks and dispersal, significant earthquakes caused by the pressurised reinjection of fracking waste, radioactive material to be disposed of as part of the fracking process and the list goes on. Todd Energy says a moratorium on fracking until we sort out the regulations would scare off overseas oil companies. These are the companies that spend well over $100million every year lobbying US politicians and threatening all sorts of calamity if profits are not prioritised over other considerations. There will be stronger measures on climate change from the US after Hurricane Sandy and Obama’s reelection, but New Zealand politicians are still not prepared to commit the country to a realistic transition plan away from fossil fuels. Todd Energy argues that natural gas is a better option than coal, but conveniently overlooks recent research including a study from Cornell University that found the greenhouse gas footprint of natural gas could be at least 20 percent higher than that of coal (Howarth, R. W., R. Santoro, and A. Ingraffea, 2011). Putting aside any moral obligation to future generations who will be the victims of a lack of climate justice in our time, we should be clear about the local risks and benefits of the industry. Three studies due before Christmas will help with that assessment and Gisborne District Council will consider them all carefully. In the meantime interested members of the public might like to check out the maps of the proposed exploration permit areas, find out some more about what is planned and give feedback to local councilors, iwi leaders and/or the Minister of Energy and Resources by the end of January. Of course the oil industry is corrupting, lobbying and coercing national and local governments to pursue their business development projects. No doubt about it. It is up to the residents to oppose and make their voices heard loud and clear. I fail to see how fracking and oil exploration in the proposed (yellow area) will help anyone live a better and healthier life; actually it’ll be quite the opposite since all companies pursuing these activities are foreign and the income generated by oil exploration will not be redistributed across the region. I do not believe in University studies anymore, as most of them are financed by corporations that brief the scientists to make sure their conclusions support their goals and justify their activities. Thank you Manu for speaking out and helping people understand better what is really going on in our world. Thanks Manu – a well articulated accessment of the Facts! which really highlight that the truth around on shore mining is corrupted by industry and goverment who have a one focus agenda on this, and that is to get in and take, at any cost, as fast as they can because they are well aware that the truth is leaking out and more and more people are waking up. Gratitude to you Manu for being a real leader, in true service of the people, our children and this precious land.